Today, the remodeling of any room includes elaboration of interior design. Creating a particular interior, you should seek to ensure that it was maximally comfortable. It should be beautiful, functional, harmonious and modern. All this is true for the kitchen. The kitchen should be, above all, functional. This will greatly facilitate the work process for the preparation of food. But the design of the kitchen can not be also ignored. After all, the hostess had to spend a lot of time in the kitchen, and the aesthetic part of the interior should not be overlooked. That`s why it is better not just to make a beautiful renovation, but to choose any certain decoration style for your kitchen. And if options are limited for a small kitchen, there abundance of designs for the kitchen of 12 square meters and more. That’s why, starting to repair the kitchen, it is desirable to consider all the details, to assess the financial costs of the project and make the design of the room. 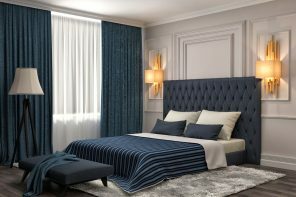 Classic is characterized by using of natural materials for furniture, strict forms, heavy curtains. 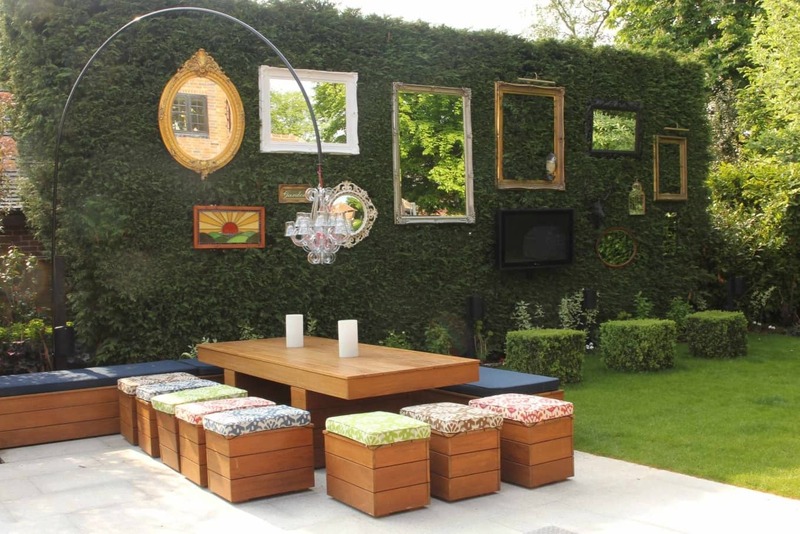 It is desirable to furnish the room with natural wood furniture, at least, its imitation will suit. The color scheme of the classical interior does not stand out with brightness and variety. It is customary to use ornate metal accessories, chandeliers of respective type as decorative elements. The most difficult thing in the classic kitchen is to insert a lot of modern appliances into the interior. Kitchen of 12 sq. m in a minimalist style should be simple and not cluttered with furniture. Minimum items – that’s the motto of this style. So here you need to take care of the compact furniture and household appliances, which must be placed so that there should be plenty of space. Forms objects should be strict and geometric. The colors should be chosen dim, mostly white, black or pastel. High-tech is a style of modern technology. Everything has to be the most advanced in it. The abundance of home appliances will look great here. For furniture may be selected as an organic material, so and plastic combined with metal. Forms objects should be simple, lines should be straight. Soft, strict colors should be selected. It is perfect to use a concrete floor, granite, tile for finishing the interior. Retro style is often used in kitchen design. Today not a problem to buy “antique” furniture. A variety of accessories will help you to make the interior complete. Any vintage thing can take place in the interior of the kitchen: clocks, vases, chandeliers and much more. But modern technology can be disguised with “old” decor kitchen fronts. Oriental theme in the design of the premises is very popular. Also, it is possible to design a kitchen in Japanese or Chinese style. In order to become a kitchen into the small area of East you don`t need much. Only a few decorative elements will suffice. Furniture with drawings on the glass, bamboo insertions, the chandelier with a dragon, a fan on the wall – and that’s enough to give the room oriental flavor. Repairs kitchen facilities usually costs not too expensive, but may also require significant financial investments from time to time. It depends on the type of repair. 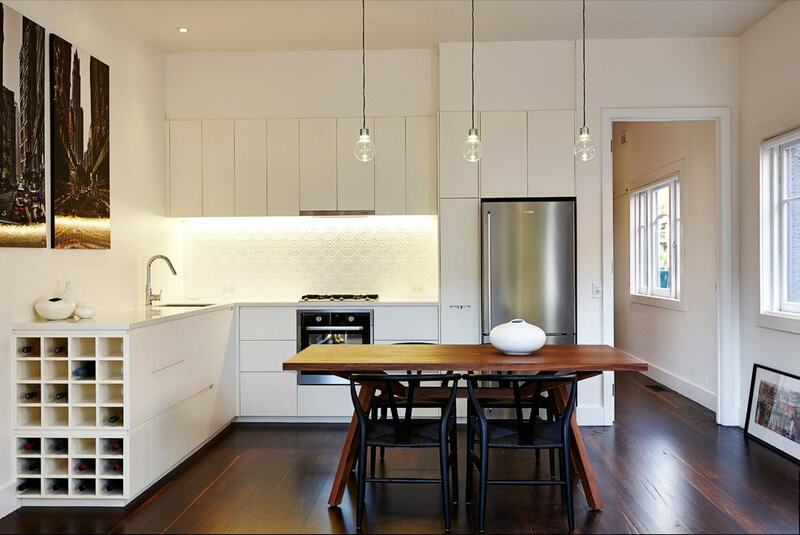 Kitchen renovation can be cosmetic, capital and luxurious. Redecorating is the most inexpensive option. Most often people change flooring, renew finish of the walls and ceiling. Windows and doors are not for replacing, so as the pipes and wiring. Buying a new furniture is not included in the budget of cosmetic redecoration. Any kind f interior design is out of the question, of course. However, this is the easiest option if you want repair you can do yourself. Such work is difficult to hold by your own. You`ll have to hire specialists, as well as their services are not cheap. Luxury class repair is the most expensive. It provides full recovery and re-planning of the premises with the replacement of windows, doors, communications, furniture, purchasing of household appliances and their installation. After repair kitchen transform beyond recognition. It will not be without a designer, who designed the kitchen with all the requirements of the customer. 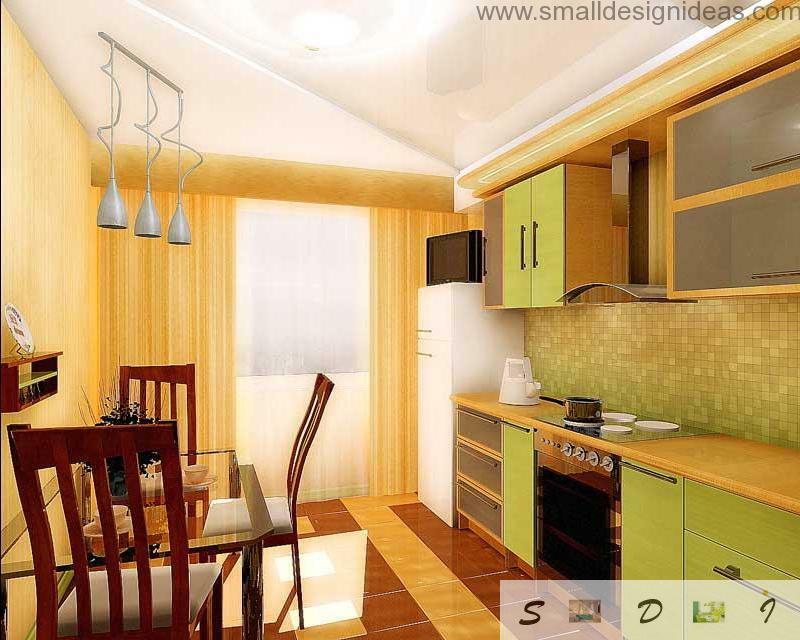 Kitchen is considered to be large enough if it fits everything you need and the room still does not look overloaded. However, the colors for its interior must be chosen very carefully. Here should not be applied too dark shades and should not be dark or black kitchen furniture, because it can reduce the space visually. Light shades also have to be used wisely. The abundance of sand color, even in a large room can create the effect of narrowing the space. Therefore, bright colors are best used in combination with dark shades. But vivid details should not be everywhere. Lots of bright color in the kitchen causing fatigue and irritation among those who need to spend a long time in the room. Bright design elements you should group by creating color accents. They will attract attention, but not annoying. Ceilings in the kitchen is better to make light or white. Especially if the kitchen has low height. When installed the built-in fixtures bright ceiling is visually higher. You can also choose the suspended ceiling with a glossy texture. This texture reflects light, the room becomes spacious, high and bright. By using different textures of tiles or flooring, you can create an interesting design. Unexpectedly good look have plastered walls combined with tiles imitating brick or stone. Kitchen of 12 sq. m is the sufficient space to divide it into zones. Zoning can be carried out in various ways. In order to separate the work area from the dining zone is sometimes used kitchen bar. Also for zoning is often used suspended ceiling of different levels and shades above different areas. The floor of the working area is usually formed with tile or granite. Near the dining table you can afford the wooden flooring. almost no interior can do without the decorative elements of the fabric. Kitchen is no exception. The window in the room should be beautifully decorated, but at the same time, be opened enough to the penetration of daylight. Today, the window in the kitchen can be designed in various ways. Excellent look have curtains or Roman blinds. But they should be selected so that the overall design of the room turned whole and complete. The type and color of textile decorations should fit the interior, its color scheme. There are also limitations. If the stove is located at the window, the you can`t hang wall-wide curtains for the purpose of fire safety. The fabric should not be close to the gas burners or electric burner to prevent ignition of the material. But if you have no other option, you can draw the window by shortened curtains. Tablecloth on the dining table is a common phenomenon. It is best to pick it up in the color of the rest of the textile decoration, to achieve the greatest harmony and beauty. Even in large enough kitchen it is often lacking space. That is why it is very important to use it most efficiently. You need to consider filling of kitchen furniture in advance, so that you can accommodate everything you need. 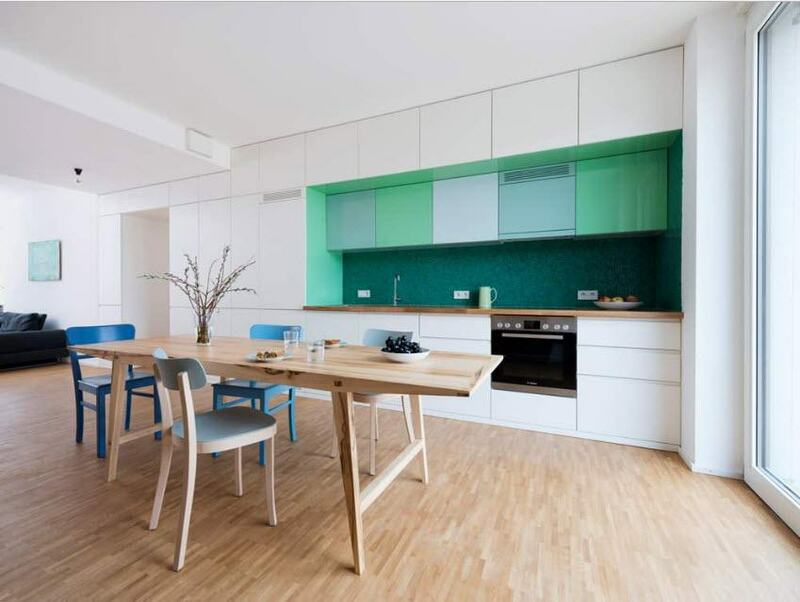 The most spacious are corner wall cabinets that are seem to be very compact even outwardly. Appliances must also be located in the kitchen 12 square meters with a maximum space saving. Very popular are built-in appliances, which is located within the sections of furniture sets. And if you plan to purchase new devices, you can be provided them free space that will later be filled. With these tips, you can arrange a beautiful and modern kitchen design. He does not have to be fashionable. The most important thing that he liked the owner, then he does not get tired and will enjoy it very long.